Tbilisi is the capital and largest city of Georgia. It lies on the banks of the Kura River. The city has a history going back at least 1500 years. It is one of the most important cities in the Caucasus region. It is often thought of as one of the most important meeting points of European and Asian cultures. The name Tbilisi translates from the Old Georgian languages as "the warm place". It is thought that this name was given to the town because of the large number of hot springs in the surrounding area. These springs have provided clean and warm water to the city ever since. There is evidence that humans have lived in the Tbilisi since the 4th millennium BCE. It is thought that a fortress was first built on the site of the modern city around the 4th century CE. Written accounts of Tbilisi's history begin in the year 458 CE. This is when historians believe that King Vakhtang I of Iberia founded the city. Over the 6th and 7th centuries Tbilisi grew in size and importance. This was due to its favorable location on the trade routes between Europe and Asia. The Byzantine and Persian Empires battled each other for control of the city during this period. In 737 CE, Tbilisi was captured by an Arab army led by Marwan II Ibn-Muhammad. Under his rule, the city was transformed into an Emirate. It was ruled by Arabs until the second half of the 11th century. Islam became the dominant religion in the city during this period. In 1122 the city was seized by the Christian King David IV of Georgia. David is often known by his nickname "The Builder". He made Tbilisi his new capital city. During the 12th and 13th centuries, Tbilisi lay at the heart of the Georgian Golden Age. It became one of the most important centers of art, literature, and culture in the region. The city's population reached over 100,000 around this time. The city was dominated by the Mongols from the middle of the 13th century. From around the middle of the 14th century, Tbilisi was ruled as part of the Persian Empire. It was ruled by a powerful appointed leader known as a vali. Tbilisi was annexed by the Russian Empire in 1801. The city was gradually connected to other major Russian cities by roads and railways. It briefly served as the capital of an independent Georgia between 1918 and 1921. It then became part of the new Soviet Union. After the Soviet Union collapsed in 1991, Tbilisi became the capital of an independent Georgia once more. Narikala is one of Tbilisi's most historic sites. The fortress dates back as far as the 4th century CE. It was first built by the Persians, who called it "the enviable fortress". During Georgia's long history it was also used by the Arabs, the Georgians, and the Mongols as a stronghold. Narikala was one of the most important stops on the Silk Road. This trade route brought goods such as silk, spices, and jewels from Asia to Europe. The fortress was badly damaged by a major earthquake in 1827. Unfortunately, it has never been fully restored. However its surviving towers and ruins are still among the most beautiful sights in Georgia. 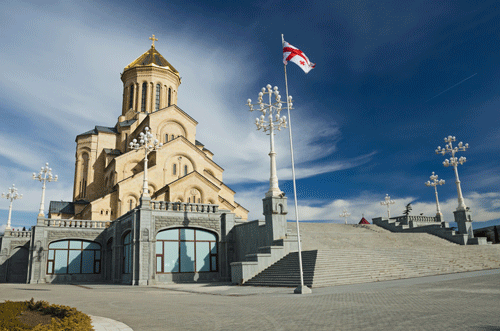 Svetitskhoveli Cathedral is a major site of worship for the Eastern Orthodox Church. This branch of Christianity is the official religion of Georgia. A church has stood on this site since the Early Middle Ages. It is recognized as a World Heritage Site by UNESCO. It is most famous for being the supposed burial site of the mantle of Jesus Christ. This is the piece of cloth that Christians believe that Jesus wore when he was killed by the Romans. The cathedral building that stands now dates back to the year 1029. Many of its most beautiful wall paintings were destroyed during the Soviet period. This was because of the government's official policy discouraging religious belief. However many of its most attractive features have been restored since Georgia gained independence in 1991. This museum is one of the most important museums in the city. It was first founded in the mid-19th century as the museum of the Russian Imperial Geographic Society. It was built to house the best examples of archeological findings from across the Caucasus region. The museum was renamed in honor of the Georgian historian Simon Janashia in 1947. The museum's main exhibits tell the story of Georgia's remarkable history through a number of different objects. These include collections of coins, jewelry, and tools objects dating back as far as the Bronze Age. Agmashenebeli Avenue is one of the most beautiful streets in the historical part of Tbilisi. The street is best known for its 19th century classical architecture. It is named after the family name of King David IV of Georgia. During the Imperial Russian years, the street was known as Mikhail Street. Many of its most impressive buildings, including the main Tbilisi Police Station, date back to this period. Over seventy buildings on the street have been extensively renovated since 2010. One of Tbilisi's most popular dishes is khinkali. These are small round dumplings filled with minced meat, onions, soup, and spices. Locals eat them by biting a small hole in each dumpling and carefully sucking out the soup from inside. Tbilisi is ___________ at a key point on the Silk Road, which was a key trade route during the Middle Ages and Early Modern period. King Vakhtang I of Iberia is considered to be the ___________ of the city. The Persian and Byzantine empires ___________ for control over Tbilisi in the 6th and 7th centuries CE. King David IV of Georgia ruled from Tbilisi during the ___________ Age of Georgian history. Narikala Fortress was ___________ built by the Persians in the 4th century CE. Eastern Orthodox Christians ___________ that the piece of cloth which Jesus Christ was wearing at his death is buried at the Svetitskhoveli Cathedral. The city is famous for being the site of a number of hot ___________ which provide it with clean and warm water. The Mongols were ___________ from Tbilisi by the Persians around the middle of the 14th century. The Russian Empire ___________ control of the city from the Persians in 1801. The building of new roads and railways to Tbilisi in the 19th century made it easier to ___________ to Russian cities. What was the name of the leader of the Arab army which conquered Tbilisi in 737 CE? Why was Narikala Fortress destroyed in 1827? Where do Eastern Orthodox Christians believe the mantle of Jesus Christ is buried? How far back does the Simon Janashia Museum of Georgia's collection date? When did Agmashenebeli Avenue start to be renovated? Simon Janashia was a well-known Georgian historian. Simon Janashia was a well-known Georgian acrobat. Khinkali are usually prepared using minced meat and onions. Khinkali are usually prepared using soft cheese and pickled cabbage. "The ruler of Tbilisi during its time as part of the Persian Empire was known as the vali." "Georgia gained independence from the Russian Empire in 1852".